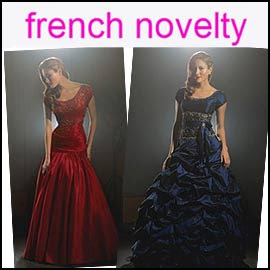 French Novelty is dress store that offers some attractive options for modest ballgowns and modest prom dresses. The description pages indicate that the dresses are by Night Moves. A comparative look at the Night Moves site did not reveal the same dresses. If you have an interest in any of the dresses, we recommend that you contact both companies for an explanation. Dress manufacturers do sometimes offer exclusive items to preferred distributors. That could be the situation here. In any case, you'll find some great colors like navy, cardinal, dark teal, hot pink, scarlet and fuchsia.